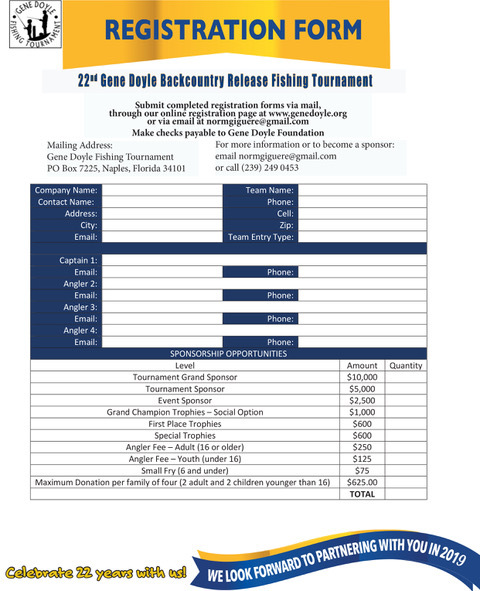 Sponsors make the Gene Doyle Fishing Tournament possible! You can also contact Normand Giguere, Claudine Auclair, or John Paulich for more information. Sponsorship Registration for more information. 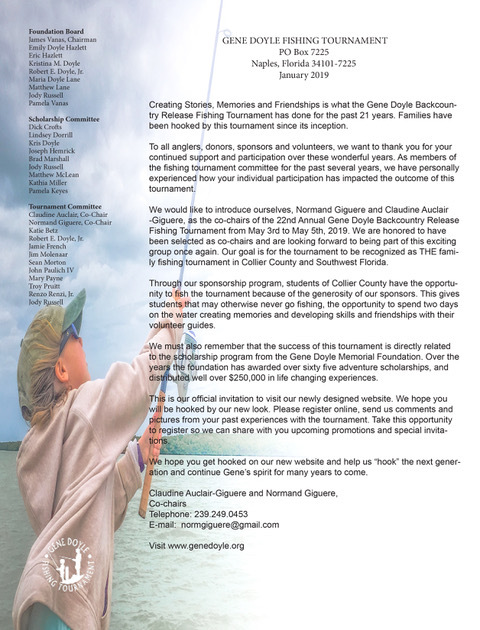 From the Kick-Off Party to the last Grand Champion trophy, sponsors make the Gene Doyle Fishing Tournament possible. From the largest cash gifts to the smallest in-kind services, the Tournament appreciates all donations and recognizes all sponsors. Sponsors at all levels are promoted on angler T-shirts, press releases, flyers, brochures, welcome banners and the Memorial Foundation website (with links available). In addition, TOURNAMENT GRAND SPONSORS and TOURNAMENT SPONSORS receive special recognition at all events, including free tickets. EVENT SPONSORS are promoted in all displays at their event and receive free tickets. TROPHY SPONSORS’ names are engraved on the trophy they sponsor, and a representative is invited to personally award the trophy to the winning angler. RAFFLE or DOOR PRIZE SPONSORS are encouraged to participate at the Awards Banquet.